Welcome to Waterdown Physiotherapy's patient resource about swimming. Let's face it; Michael Phelps has made the sport of swimming incredibly cool. It was amazing to watch him glide through the water like it was his home, as if he had flippers instead of hands and feet. Michael Phelps assisted in opening up the world of swimming to a new generation of swimmers, and he has inspired existing competitors to jump back in the pool. 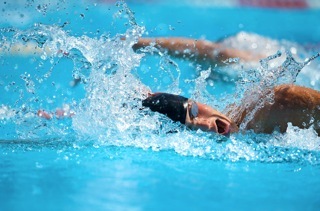 While the sport has always typically been considered low risk, with the exception of holding your breath and staying under the water too long, there is an opportunity to hurt yourself and keep you in the shallow end through the repetitive motion that can lend itself to a shoulder injury. This specific section of our site is dedicated to you, the swimmer. It is here that you will find the information and exercises that will keep you competing in the butterfly relay and not doggie paddling in the kiddy pool.